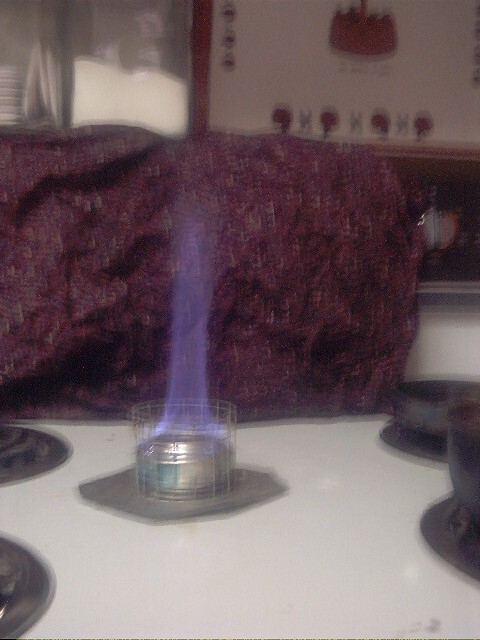 The very first double wall alcohol stove I ever built was the Soda Can Stove. It is without a doubt the easiest stove there is to make. Initially I did not have great success with this stove compared to other models, but with practice and experience comes better methods of construction. My initial stoves would take longer than other stoves to boil water, and wouldn't even achieve boil at times. I was also very interested in a stove that would simmer, and these stoves could not. So I decided to use the Cat Stove as my primary stove for a long time. After conversing with other hikers, specifically Buddur who gave me the idea to use slits and how to make a simmer cap, that use these stoves, I realized there were better ways of doing things. Combining that with my own techniques for making stove stands and windscreen, I came up with a better mousetrap. 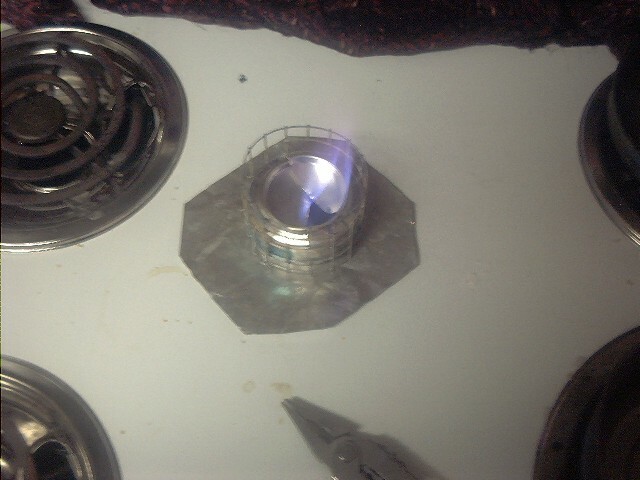 Start by making a standard double wall alcohol stove like this one: Pepsi Stove. Instead of making the burner holes like is shown, use a knife to cut 8 slits about 1/4" long in the same place the holes should go. Next you make a stand using hardware cloth that fits snugly around the stove. The top of the stand should be about 1" above the top of the stove. Then take the bottom of a soda can and cut it in half to make the simmer ring. To use the simmer ring, let the stove cool down, then put both halves on top of the stove to mask the burner ring. Open the simmer ring by sliding one half over the other until you get the desired hole size for the desired simmering heat. Finally, make a windscreen using the instructions Building a Better Windscreen. 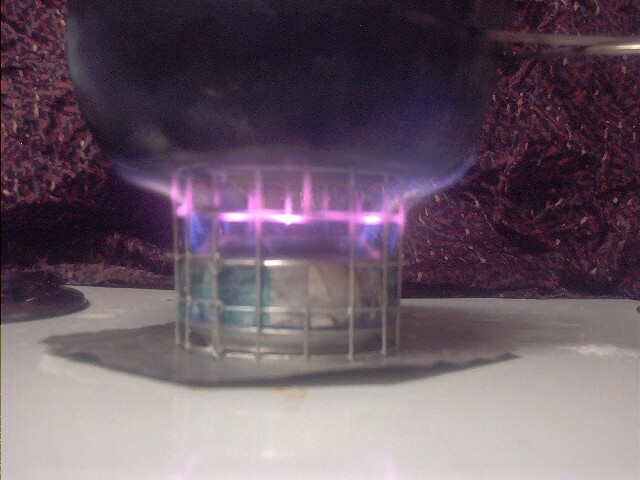 Weight: 1.0 ounce stove, .6 ounces windscreen, .6 ounces for 10 ounce fuel bottle. Total = 2.2 ounces. Materials: 3 soda cans, some fiberglass insulation, some metal tape (optional), and a 4x19 square piece of hardware cloth. Tools: Knife, scissors, and a pair of pliers. 1. 2 cups of water at room temperature – 65 degrees. 2. Pot used is a Snow Peak 720ml titanium pot without lid. 3. Stove used the same windscreen as my Cat Stove. 4. Alcohol was tested in 6 ml increments, starting at 12 ml alcohol. 11. Thermometer used is a Thermocouple connected to a digital multimeter. The probe was ¼” below water surface. Estimated accuracy is ± 3 F.
12. Air temperature was 70 degrees with the stove fan running to simulate a light wind. *** Notes. 175 F is the temperature I have found most foods to actually be cooking. I did a comparison of this exact same stove, the only difference was the final model had fiberglass instead of empty double walls. The difference is amazing. The fiberglass limits the amount of fuel the stove uses to prime and is very efficient at forcing the stove to use the jets for cooking. 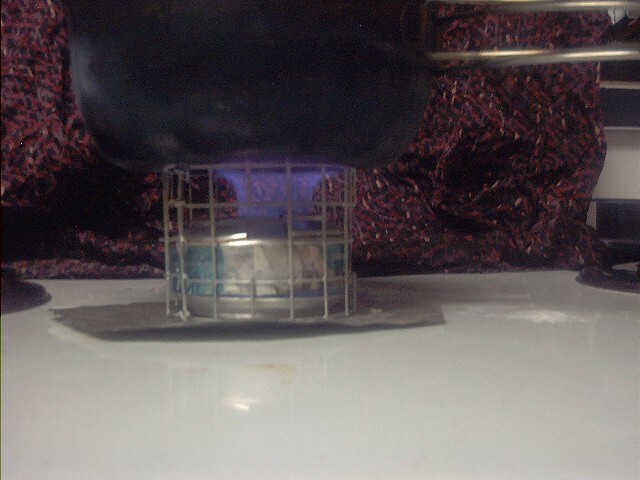 The result was enabling the soda stove to achieve true boil using only 18 ml of alcohol fuel. The weight was slightly higher than I had planned because of the amount of space inside the double wall and the amount of fiberglass it took to fill it. The burner pattern is better for pots wider than my Snow Peak with it's 5.25" diameter. When choosing between the Turbo V8 and the Soda stove, I believe the main factor should be pot capacity and diameter. Buddur's burner hole design makes the stove simple to build - anybody with a knife can make one. No messing around ant playing with drilling holes hoping it comes out right. I also tested the simmer cap and found it so adjustable and easy to use, and it only ads about .1 ounces to the stove. I was able to tune the simmer cap down (quite easily) to the point where 12 ml alcohol burned for over 30 minutes! **Note. For purposes of this illustration I am considering my fuel bottle a 20 ounce soda bottle. I will stick to my Turbo V8 stove because of my smaller pot, but if I were to use a 1.5 liter Ti pot, I would most likely switch. 1. It maintains a temperature above 175° for such a long period of time on 12 ml fuel that it would be an excellent stove for low fuel usage simple cook meals. 2. The simmer cap is the most user friendly version of soda can simmering I've ever seen.